This colourful salad is light and simple. Prepare the syrup up to 2 days in advance and the fruit up to 4 hours ahead. Save all the juice when cutting up the fruit, and add it to the salad. Heat the sugar and 100ml cold water in a small pan over a low heat for 2-3 minutes until dissolved. Then simmer for 4-5 minutes until it forms a thin syrup. Set aside to cool. Halve the passion fruits, scoop out the flesh and seeds and stir into the cooled syrup. Set aside or chill until needed. Cut off the crown from the pineapple and slice off the skin. Cut it in half lengthways, then each half into four wedges, removing the core. Cut each wedge into 8-10 slices or triangles, place in a bowl and sprinkle with lemon juice. Add the mango, papayas and lychees to the bowl. Stir half the mint into the salad and the remainder into the passion fruit syrup. 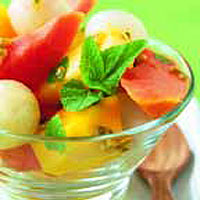 Just before serving, spoon the syrup over the fruit, then decorate with mint sprigs and serve with lime wedges.